Named after the famous astronaut from Space Oddity, Major Tom online casino combines the best of two worlds: lucrative bonuses and promotions of new online casino, with safety and trust of an old established company. Major Tom casino was launched in 2013 and recently acquired by Digimedia Ltd, the company behind Royal Vegas, Red Flush, Platinum Play and few other popular online casinos. 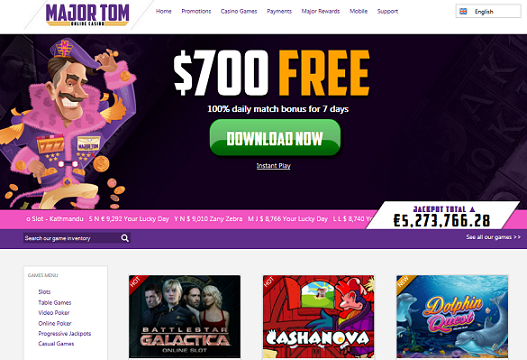 Major Tom is new addition to Fortune Lounge chain of casinos, one of the oldest online casino operators. 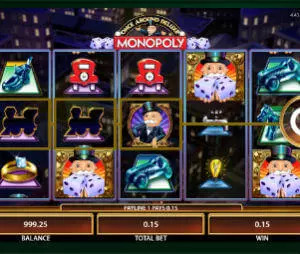 It offers a full range of Microgaming casino games, which means that there isn’t a single casino game that you won’t find. You can play all the games by download the casino software or using the instant play version. Slot machines: slots for every taste: 3-reel classics, fruit slots, 5 reel video slots and more. We recommend checking the new Game of Thrones slot and the popular Thunderstruck and Great Griffin slots. If you are looking for loosest slots, start with Megaspin Break da Bank, which offers 98% payout; or Retro Reels – Extreme Heat, with 97.5% RTP. Progressive slots fans can start with multi million Mega Moolah slot machine. Other casino games: European Roulette, French Roulette, American Roulette, Craps, Baccarat, Keno, Scratch cards, Bingo. In total, there are over 500 games to choose from, including over 400 slot machines. As we said, one of the advantages of a new online casino is the welcome bonus. 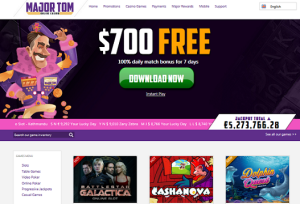 Major Tom online casino offers new players a $/€ 700 welcome bonus. During the first week, you can get a 100% daily bonus, up to $/€ 100. The minimum deposit is $/€ 20. On your first deposit, you will also get 500 loyalty points which can be later translated into free chips and other rewards. The wagering requirement on this bonus is x40 times (equals 20 times bonus + deposit). Wherever you are located, Major Tom offers a wide range of deposit and withdrawal methods. The minimum deposit is $/€ 20. The minimum withdrawal is €50. Withdrawals are processed quite fast: E-wallets: 24-72 hours. Credit Cards: 3-5 days. Maximum withdrawal per week is $/€ 2500. Digimedia Ltd is one of the oldest and most reputable online casino operators. The company operates 8 online casino and they’ve been doing that for over 15 years. Similar to their other brands, Major Tom operates under Maltese license and it’s audited on a monthly basis by eCOGRA. New and exciting online casino backed by a reputable and familiar company. Now it’s the best time to take advantage of the special $/€ 700 welcome bonus.